“Since our wedding was in the spring we wanted to have it feel like we were in a garden, so we knew we would have lots of flowers. Rob liked the chalkboard look so we incorporated elements of that throughout the decor. We had quite a few DIY projects! My mom and I spent many hours on the hanging flower balls that were used for the reception. The table numbers were also a fun project, I added lots of glitter to the frame of the chalkboard and wrote the numbers with chalkboard marker. All of the chalkboard signs we decorated and wrote sayings or directions on. Most of the decor for the cocktail hour we also created or added our own touch to; we had little potted succulents that were painted with gold and chalkboard paint. We also had little sayings that I added to wooden frames. My favorite project was making my nieces flower girl dresses even though it was a lot of work. They were so adorable in the dresses, and my oldest niece kept calling it her wedding dress! My favorite moment was walking down the aisle arm in arm with my dad and looking at Rob as we got closer, it was very emotional! I also liked our first look because it was just us in the moment, and our photographers captured every moment of it! Rob’s Favorite moments was the first look and the portraits cause we had a lot of fun with it. 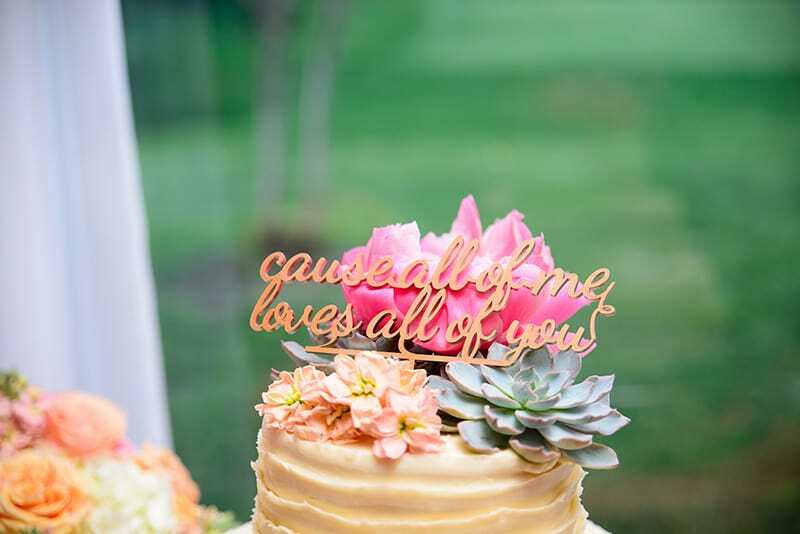 Don’t you just love the DIY details of this wedding? So simple but massively impacted the day! Love it!